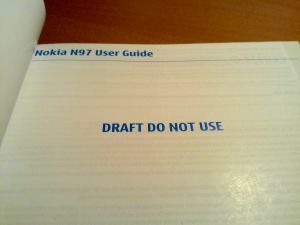 Nokia N97 From Developers Perspective | BDC Software Inc.
Let me state upfront that this is not a typical phone review. Rather it’s the first part of series of articles written from a developers “point of view”. I will try to go over how it is to develop on this phone, the experiences while using it and of course the issues I encounter. I am a developer and I do develop software for Nokia phones. As any developer user will know, no tool and no software application or platform is ever perfect. There are always issues. It’s just a question if the benefits outweigh the downsides. That’s all. I like this phone. Did I have doubts and questions before I bought it? A big YES. This was mostly caused by other people’s reviews and ultimately a good thing because it lowered my expectations 😉 For instance: I wasn’t expecting much from the keyboard but I really like it. It’s perfect for me and I much rather use it than the keyboard on an E71. 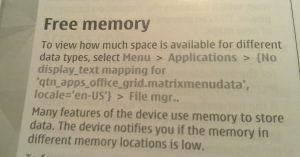 Another issue was the free memory on the phone. After I stopped some useless apps from running at boot-up, I ended up with 50mb free for the apps and tools I need. Overall this phone is already the best phone I have ever used. It’s fast and easy to use. The new theme looks very polished. Keyboard is excellent. And of course the phone has so many features that I’m still surprised every day by something new I uncover. I am also amazed how good the phone sounds as an mp3 player. It beats my ipod, sansa and every other mp3 playing gadget I own. Why does the NAM edition ship with a manual that states on the first page; “DRAFT DO NOT USE” and why are there localization translation errors in the manual? I really like the new menu organization feature. Nokia finally found a way to intuitively move the shortcuts around. Excellent. Well, apparently some shortcuts don’t like to be moved and “move back” automatically a short time after they have been moved. I swear I moved all the game shortcuts to the games folder at least four times and every time after a few hours they get moved back to the app menu by some system process. There is also an empty “MfE” folder in Applications that should not be there. Either ship MfE or get rid of the folder. Another annoyance that’s bugging me quite a lot is the inability to uninstall crap like Boingo and JoikuSpot. I will never use these apps. Give me a way to uninstall these and reclaim the space on the phone. Boingo is especially evil because it comes with a protected access point that you can’t delete! One of the more serious issues is the 11 browser crashes I experienced in the first week. Two of them happened on flash laden sites, but the rest happened on simple google search pages. This is a bit concerning considering how much functionality of this phone is based on the browser engine but the good news this only happened while browsing websites and not while using any widgets or apps. This has occurred multiple times but I was unable to figure out the steps to reproduce this. Essentially what’s happening is I lock the phone, put it in a pouch and next time I take it out either the phone is unlocked or the phone is locked but the front facing camera and app are active in the background. This has happened multiple times but it’s not easy to reproduce.